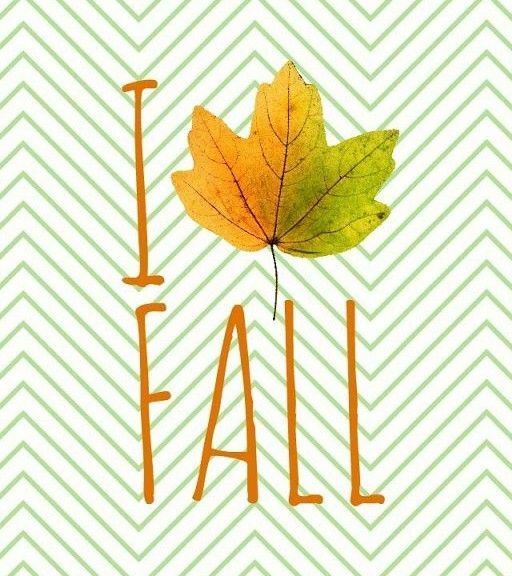 You know, you know....I am obsessed with fall. Really, what's not to love about the chilly temperatures, the color-kissed trees, falling leaves, hot apple cider, flannel, and so on? One thing I forget to mention in all the things I love about fall is the fashion that comes with it. It's my favorite time of the year to get dressed, easily. I can't get enough plaid, patched-elbow sweaters, wool, boots, knitted scarves, quilted jackets, and vests. It's making me giddy just thinking about it! This year, I've decided to get ahead of myself the game and start filling my closet with some autumn essentials. I'm a bargain gal and unless it's just a really good deal, I rarely buy anything at full price. Why would you do that? (I have my mom to thank for this habit. Aren't you proud, Mama?!) So when Nordstrom had their Anniversary Sale, I jumped on the bandwagon for the first time ever. And I'm glad I did because I got some fabulous steals deals. When bargain hunting, I've found that it helps having a particular item in mind. It makes things simpler and narrows down your focus. Otherwise it could get overwhelming, and no one wants to be overwhelmed when shopping, just ask husband. This round of scouting, I was after some booties. I've never owned a pair (gasp!) and I've been dying to try them out. Because I'm tall (5' 8"), I knew I didn't want anything with a big heel. I'm not trying to be a skyscraper after all. So short wedges, yes and heels, no. I also knew that I couldn't go with just a flat bootie because I'm also not trying to give my foot the appearance that it is huge (I wear a 9.5 size shoe). Leather was a must and suede was a second go-to. I started browsing. 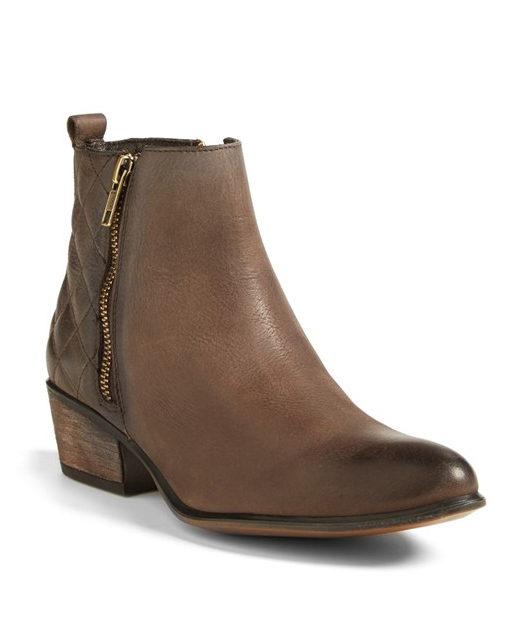 The first pair that caught my eye was a brown leather pair of booties with a quilted back *swoon*. As someone who never/rarely buys clothing or shoes online, I took a leap and ordered them. They arrived and they were perfection! Can't you picture them with a pair of dark skinny jeans or a simple dress?? These might become my new favorites for fall. But, I was still wanting something with a wedge. Something that would work for dressier outfits and dresses. Something a bit sassier. Another bout of browsing and I discovered these beauts. 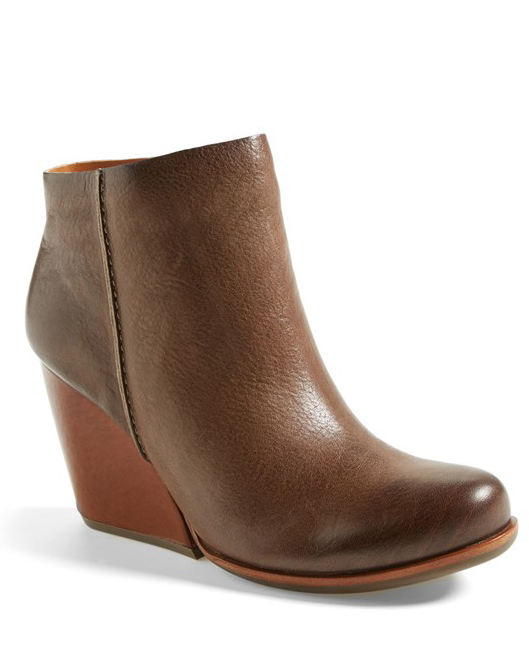 Already being the owner of a pair of Kork-Ease pumps, I knew that I would love this pair of wedged booties. So I took another leap. I died when I put them on yesterday. They're exactly what I wanted. These are the pair I'm sporting in the first photo. 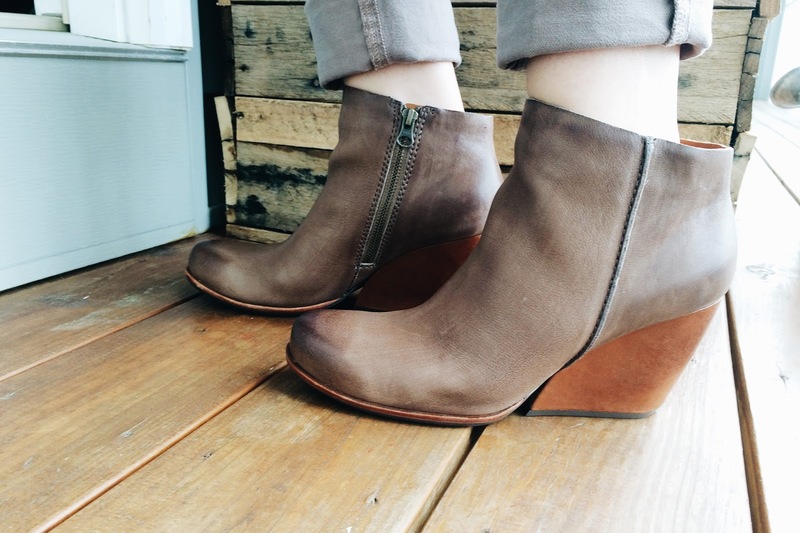 These booties are going to look great with skinny pants, dresses, and skirts. I'm pretty stoked about them and their 'look'. I'm really thrilled with the booties that now grace my closet. They both fit like a gem and I didn't have to exchange them or return, such a plus! I'm looking forward to slipping each pair on and wearing them out in some beautiful fall weather. They're gorgeous and you know you want a pair or two. Am I right? Or am I right? ?